Heat oven to 350°F. In medium bowl, toss peaches and pears with lemon juice. In 4-quart nonstick saucepan, heat 1/2 cup sugar, the water, cornstarch and 1/4 teaspoon of the cinnamon to boiling over medium heat. Stir in peaches and pears. Cook until hot and bubbly, stirring frequently. Add strawberries; cook and stir 1 minute. Pour into ungreased 13x9-inch (3-quart) glass baking dish. Cover to keep hot. In small bowl, place melted butter. In another small bowl, mix 2/3 cup sugar and remaining 1/4 teaspoon cinnamon. Separate dough into 8 biscuits. Cut each biscuit into quarters. Lightly roll each biscuit piece in melted butter, then in sugar mixture to coat. 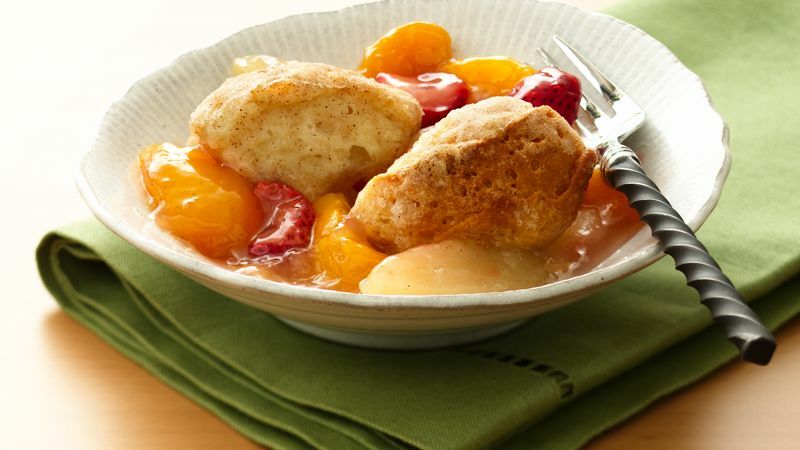 Arrange biscuit pieces point sides down on hot fruit mixture. Bake 35 to 45 minutes or until biscuit pieces are deep golden brown and bottoms are no longer doughy. Cool at least 20 minutes before serving. Add a drizzle of cream or a dollop of vanilla yogurt and you'll have a true crowd pleaser.